Public art mural by Solomon Enos on the construction fence of Howard Hughes Corporation's Waiea luxury condominium. Artist Solomon Enos at his studio in Nuuanu. 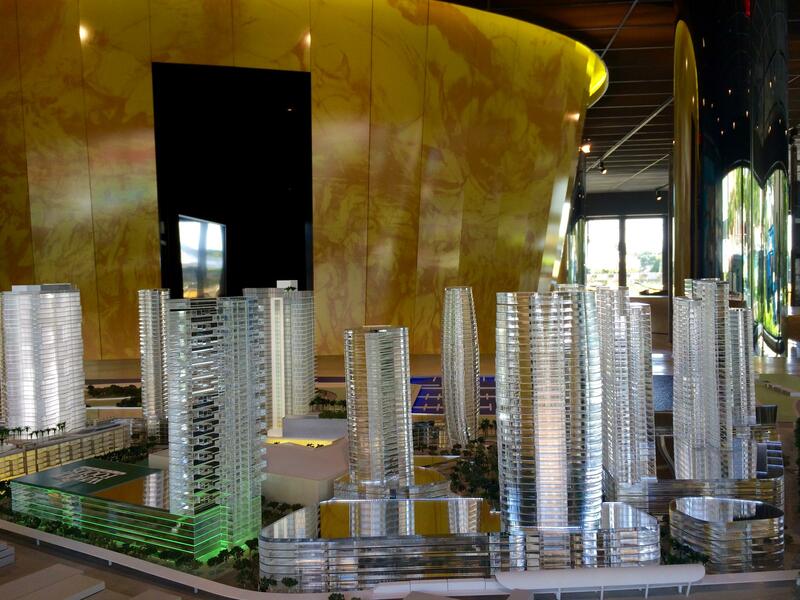 A model of what Ward Village will look like in the coming years sits in the lobby of the IBM Building in Kakaako. In the background is a commissioned piece of art by Native Hawaiian artist Solomon Enos. Over the next couple decades, as many as 30 mid and high-rise buildings are expected to pop up in Kaka‘ako. And as HPR’s Molly Solomon reports, art is often playing an important role in the marketing of this real estate. The Honolulu Printmakers have invited a dynamic young Chicago team to jury their new exhibition, and a splinter group is half way through wrapping a major Honolulu building site in thousands of prints. HPR’s Noe Tanigawa surveys the activity. The Honolulu Printmakers’ 87th Annual Exhibition opens Wednesday with festivities and a DJ. The Office of Hawaiian Affairs is looking to the community for input on how it should use the 30 acres of O‘ahu land in Kaka‘ako Makai. The state agency has been holding a series of public meetings across the state. HPR’s Molly Solomon attended the first one in Kaka‘ako and has this report. You can submit testimony online here until March 31st. The schedule of remaining public meetings is below. Tuesday, Feb. 24 – Hilo – 6 p.m. to 8 p.m. Lately HPR has been examining how arts and culture are playing a key role in kakaako’s development. In this latest installment, Noe Tanigawa headed to the community’s center, Mother Waldron Park, to chat with the founder of Pow!Wow!, the street art festival that’s changed the look of the neighborhood.